The Peteetneet Museum and Cultural Arts Center was named after the Ute Indian Chief, Peteetneet, who lived near the creek that runs through what is now called Payson. Although he died on December 23, 1861, the Peteetneet School, which was erected in 1901, was named in his honor. This building is an historical landmark in Payson. 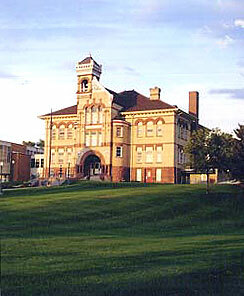 The Victorian style building served as an elementary school until 1988. At that time, it was abandoned by Nebo School District. The property was then returned to Payson City and they wanted to demolish the beautiful, old building. Larry Brown and Dr. Gordon Taylor led a group of citizens and formed People Preserving Peteetneet to save the historical building from the wrecker’s ball. It was the concerned citizens group who took a stand to preserve this beautiful edifice. During the first few years of the restoration, it was not uncommon for Dr. Taylor and others on the committee to work 8-16 hour days helping to restore and maintain Peteetneet. They were willing to do hard manual work to help restore the building to its original beauty. Dr. Taylor was able to acquire available grant monies, and mobilizes other volunteers to help when needed. The Historic Peteetneet Museum and Cultural Arts Center represents an ongoing act of love expressed by the community to all visitors. Not only is it the restoration and preservation of a beautiful historic school building, but it is a gathering place for children and adults who want to enjoy the facility and what it has to offer. The hills around Peteetneet provide a fun location for free Snow Sledding and Tubing during the Winter Snow Months.